Discussion in 'Off-Topic' started by skip_intro, Oct 1, 2011. Newly smithed in the Blog! Oh, lets not be bashful about this newest addition! I like what these attack boost cards can do for deckbuilding--because of the parabolic growth to damage attack boosts like bash give you, it could be really beneficial to try to stick to a theme rather than just jamming in a mismash of your highest cards. While we're on the parabolic bonus of attack boosters, ponder this: If you play every bash in a hand, then 1 bash = 4 damage, 2 bash = 10 damage (4+2, then 4), 3 bash = 16 damage, and 4 = 24 damage! And this is only with a +2 bonus. Chaining these attack boosters can really bring the pain. Speaking about card chains--do we think there will be a maximum or minimum of cards we can have in a deck? Could I arm my warrior with only a hammer (and maybe some armor) and just let him recycle through a 10 card deck comprised primarily of bashes? On one hand this sort of fits a berzerker playstyle--all this character can do is hit things hard, but on the other hand it trends towards breaking some sort of heretofore unspoken spirit of the game. Minimum deck sizes are really important in card games to stop one or two powerful cards dominating. In Card Hunter though, we have a cool trick that enforces a minimum deck size without actually making you count cards. Won't this be constrained by the gear you can carry? That's sort of what I was wondering--do I have to fill every gear slot with something, or could I thin my deck by choosing only to equip some of my gear slots? Say I have a lot of low-level stuff with a bunch of nasty drawbacks and one uberhammer, could I just roll out with the hammer? Jon's reply makes me think not, but I'm still unsure. Yes, I see what you mean - can your Barbarian just go with the Sacred Jockstrap of Howard and a Hammer of Bashiness and hope the Bash multipliers get you through? Jon's said that he's not seen a game where you deck out, but maybe no-one has tried that Barbarian build, which I think might get close, if you're willing to burn through your deck to get the couple of cards you want to keep in your hand. Indeed, that is what happens when you draw through your deck. The penalty for churning through the whole deck is an interesting idea. It hasn't proved to be necessary to have anything like this yet though. I understood that to mean that the penalty is unnecessary, not that nobody ever drew through the whole deck. Not important, though. It may take a little longer to gather, but equipping several "common" items with synergy -- say, a Plain Warhammer in each hand, Brass Knuckle gloves, Mule Kick boots, and a Sucker Punch skill for a deck brimming with Bashes -- should be very possible. I won't worry much about minimum sizes if I can make a character who has a full deck built on the same plan. Yep. What I'm wondering now is to what degree equipment is specialized to one class or another; or vice versa, to what degree each class is specialized to a subset of strategies items. I can see that character building = deck building will be a very important game mechanic. Classes in Card Hunter are in many ways analogous to colours in Magic. One of the big things we're discussing and trying to figure out now is how much "colour bleed", i.e. movement of abilities, we'll allow across different classes. Ah, handy analogy. Like how MtG has five colors should we expect a roughly similar number of classes? I'm a-thinkin' about what this card blog says about overall card setup. So, the "beige" and "grey" appearance for regular vs. reactive cards translates literally into two entire text boxes. So with the above example, you have to look at three boxes (the top box having all the card tags and the equipment name) and put each in its place. After seeing damage and range at the bottom of every attack card so far, it threw me for awhile to see them suddenly higher up. 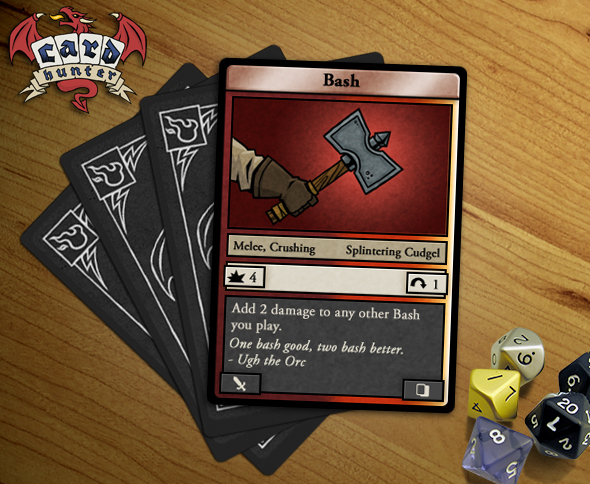 It's easy to imagine other cards where the beige and grey boxes are differently sized, so your damage and range could be floating all over. Very easy to read now, although the explanatory text is lost. Lastly . . . Bash. It beefs up your Stunning Bash. Heal . . .
. . . What do you suppose are the chances that Heal could be repurposed to boost your other Healing spells? If it were me, I'd probably design it so that keep each type of effect/ability has their own "signature." So Bashes build on each other, Stabs might tend to come with movement abilities, Heals might go with Card Drawing (I think that makes sense thematically), etc. 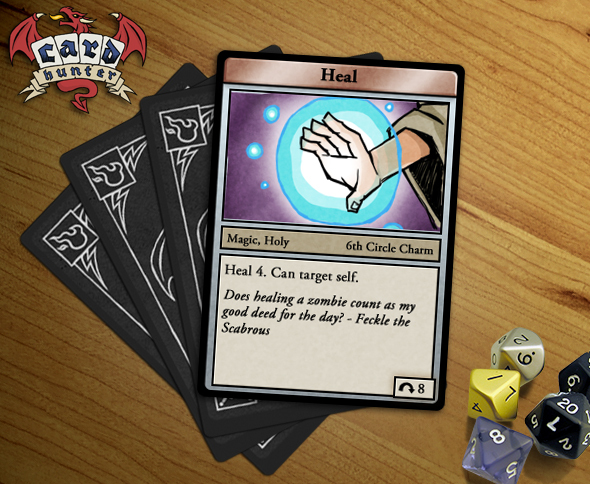 I'd like to see a priest's holy attack spells be able boost healing--almost like a Cleric's spontaneous casting in D&D--but I find your "signature" idea to be very interesting. Card drawing might be a huge bonus though, if the value of drawing a card is anything similar to the value of drawing in MtG, although maybe we already have seen otherwise in the block card. Either way, I could easily conceive of boosters to movement, armor (although I guess armor already kind of stacks), magical attack, healing, and the like. Not such a handy analogy for me (I haven't played Magic) but I think I get the idea. I could always go read a wiki or something. Hm, I count Warrior, Rogue, Wizard, Priest, and Barbarian makes five classes: a good, analogous number. I hope you're not holding out on us, Jon. I've been thinking about decks vis à vis characters as a two-tiered game. From the battle screens, I estimate (keeping in mind the uncertain value of admitted mock ups) somewhere about 40-50 cards for each character; building a character deck is the first tier. But the Player gets a total deck of 120-150+ that just happens to be divided into three piles: building the Player's deck is the second tier of strategic play. As someone who always liked to have as many specialties as possible represented in my party, I'm feeling really curious (read: antsy) about how I might, or might not, get representation of all five (eight? - counting human, elf, dwarf races as well) skill sets into my three piles, and to what extent it could be advantageous or superfluous to do so. Yeah, I know: you're discussing it! I'm just anxious for news, any news. It could just be that each character "paperdoll" has default items in each equipment slot. Default items have a basic set of cards associated with them and can't be removed, only replaced. Head, Neck, Left Hand, Right Hand, Chest, Waist, Ring (possibly 2), Legs and Feet. Say 10 slots total. I think the smallest item set we've seen so far is 3, which would mean a minimum deck size of 30. You, sir, are spot on. Hmm, interesting. How those defaults pan out for each class will be nice to see. And how feasible using the default sets will be long-term in PvE if I feel like doing dumb self-imposed challenges. They probably work as well as every Secondhand Sword and Rusty Chainmail Vest has worked for adventurers since the dawn of fantasy. If you can go kill a dragon with 'em we might buy you a round, but it'll sure disappoint the stonecarver -- he already started on your tombstone. But if my mighty threwed Barbarian doesn't want to wear a helmet or armour, can I have a Skyclad suite that slots there but confers no cards?